When Benje Bendele clicks his fingers, something magical usually happens. “High Five” at the Wrangler NFR with Benje’s Top Five Highlights Awesome 5th round! 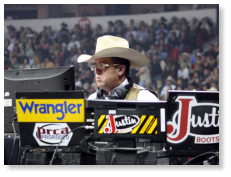 Benje Bendele Working the Wrangler National Finals Rodeo. CLAREMORE, Okla. – When Benje Bendele clicks his fingers, something magical usually happens. Bendele’s sleight of hand makes for sweet sounds of rodeo.